Highly desired condo complex. Perfect for Owner occupant or investor. Now imagine...owning an affordable home close to the Historic Plaza with a year-round heated pool! Updated in July 2018 with new carpet and custom painting, this one-level west-facing condominium [1 BD, 1BA, evaporative cooling, stainless steel appliances, balcony, storage] only has the sky and stars above. 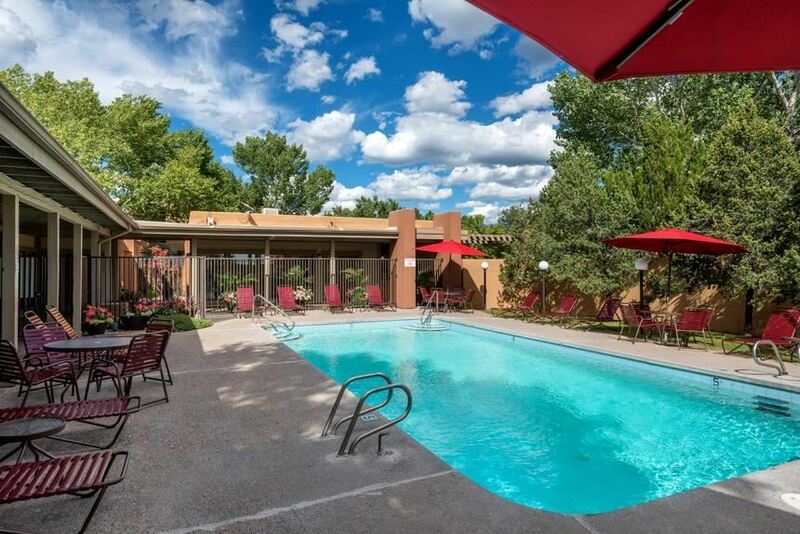 This location is one of Santa Fe&apos; best kept secrets for your first or second home. Your amenities include all year heated pool and spa, first-class gym, secure entry, clubhouse, on-site management, laundry facilities and extra parking --- all in a non-smoking and park-like setting of 16 acres. Here, you are free to enjoy Santa Fe. The Plaza, the Opera, Starbucks and the Ski Basin are minutes away. There is no roof or stucco to maintain or a landscape to create and nurture. Your low HOA fee provides worry free value. This original owner saved you more money with custom updates with tile floors and counter tops, stainless steel appliances and custom cabinets. Schedule your appointment today!